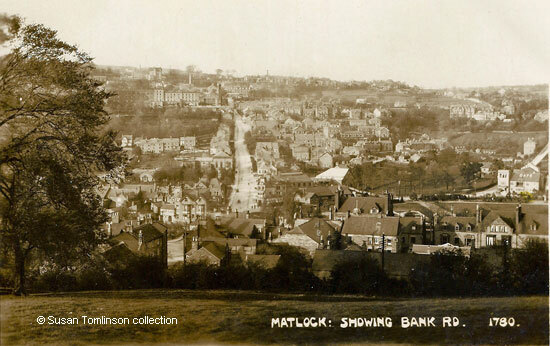 Sneath's picture of Matlock Bank was taken in either 1926 or 1927, so before the tram was closed in 1927 but after the shops at Park Head had finally been demolished in 1926. Street improvement in the town centre had been on the Council's radar since 1919 when they had been initially unsuccessful in purchasing these small shops. The eventual removal of the row that obstructed the view of the Hall Leys, Matlock's biggest public park, was seen by many as a great improvement as it provided an uninterrupted view over the Hall Leys from Crown Square. In May 1926 the local Council announced that the County Council had made a contribution of £2000 towards the Crown Square improvement. Unfortunately for the Council's plans, a couple of months later the Matlocks UDC received a letter from the County Surveyor stating that the County Council were unable to widen the bridge over the Derwent, citing financial reasons. The same year a Derby journalist recommended a ramble from Matlock: "After leaving Matlock Station turn sharply to the right up the hill over the railway bridge. Look out for a notice board indicating the footpath to Salter's Lane and Bonsall. The steep field path affords extensive views ; to the north the fine vista of the Derwent Valley is opened up". The view he described was a favourite with photographers over the years. is a large advertisement for the store. The black elephant has replaced it today. "Matlock: Showing Bank Road": Published by R. Sneath, no. 1780. Not used. "Derby Daily Telegraph", 22 May 1926. Town and County Gossip. "Derby Daily Telegraph", 18 May 1926. "Derby Daily Telegraph", 20 July 1926. "Derby Daily Telegraph", 27 July 1926. Nature Notes and General Topics. A Holiday Ramble. Go to the Just Matlock images (item 16) where there is a link to a modern photograph.